Web traffic analysts DeviceAtlas compiled an extensive report on the smartphone usage in Q2 2017. According to the company, Snapdragon 410 chipset is the most popular, just head of the A7 & A9 duo by Apple. The company also posted numbers about RAM, Dual SIM and “Year released” popularity across the globe. Qualcomm chips are the most popular in the Android world, according to the analysts. The San Diego company is a leader in developed markets like Japan, the US, the UK and Continental Europe. Developing markets like India, Egypt and Colombia have double-digit usage of MediaTek chips, and the Taiwanese vendor is leader with more than 35% in Nigeria. The same goes for the GPU distribution. Developed markets have higher numbers for PowerVR units, mostly used by Apple on their iPhones. Russia, Poland, and South Africa have between 25% and 40% share of Mali GPUs. An interesting statistic is the RAM trend. 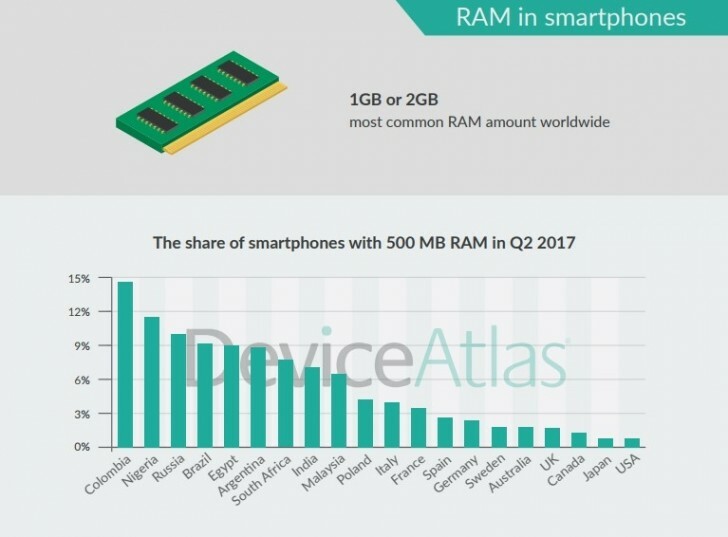 Although we already have more than a dozen 8GB RAM phones in the market, devices with just 500 MB memory are still widely used in Colombia, Nigeria, Russia, Brazil, Egypt and Argentina. DeviceAtlas also analyzed the usage of dual SIM phones. More than two-thirds of the phones in India support two SIM cards while the USA is on the other side of the spectrum with only 4.1%. According to the analysts, most prevalent phones are built in 2015 and devices from 2012 are still more popular than phones from 2017. Going in detail, Samsung Galaxy S7 (along with the Galaxy S7 edge) is currently the most used Android phone. You can check out the full report by following the source link below - there plenty of other interesting numbers in there. "Samsung Galaxy S7 (along with the Galaxy S7 edge) is currently the most used Android phone," go Sammy! Rocking 2 gigs of RAM in my Lumia 930.